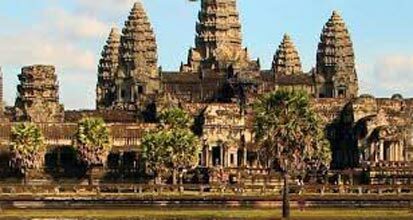 Cambodia and Thailand are two of the most popular destinations of Southeast Asia, offering vacations that are an amalgam of religion, fun, sumptuous food, entertainment, exotic wildlife, shopping and more. 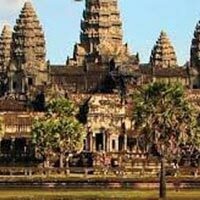 Cambodia and Thailand tour, expanding in a duration of 7 days, offers you a chance to explore the best of sights and sounds of these two places. This well-planned itinerary takes you to wonderful places like Siem Reap, Bangkok, Coral Island and Pattaya. Enjoy temple tours, sightseeing, birding and wildlife watching, boat trips, shopping, adventure activities and so on. As you arrive at the Siem Reap International Airport, get an assisted transfer to the hotel and complete the check- in formalities. Savor lunch at a local restaurant. Later, enjoy a visit to Chong Kneas- the beautiful floating village. Dotted with indigenous stilted houses over the water surface on 8-10 m high stilts, this natural mangrove has hundreds of birds and freshwater fishes. This village has around 3000 inhabitants. Hop into a traditional wooden boat to cruise through the flooded wilderness of the Great Tonle Sap Lake. Sight colorful birds. Visit a local school and an island pagoda. Have an interaction with the local families by visiting their traditional stilt houses. Back to Siem Reap for refreshment and dinner at a local restaurant. After breakfast, get ready for temple tour of Siem Reap. Start the tour with Angkor Wat temple- a wonderful proof of Khmer architecture. One of the most popular temples in Cambodia. Of all the Angkor temples, this temple is the largest, most important religiously and is known for its stunning carvings. Enter the main building, ascending through galleries. Before arriving at the central sanctuary, savor wonderful views of the surrounding. You visit Ta Prohm temple, one of the most popular Angkor temples, which lies amid unclear forest-like setting. Afternoon is scheduled for a visit to Angkor Thom. Spread in an area of 10 km, bounded by wide moats, this city is one of the most popular sights of Angkor. Enter from the huge South Gate, dotted with statues of gods and demons. Keep walking towards the Terrace of the Elephants and the Terrace of the Leper Kings- areas for public ceremonies. Explore the ruins of Baphuon, Royal Enclosure and Phimeanakas. Next in line is Bayon Temple- another popular temple in Angkor. Visit the galleries with bas reliefs. Dinner at a local restaurant. Today after breakfast, enjoy a guided tour to Angkor Silk farm to know about the cultivation of mulberry bushes, production of silk fabrics and accessories. If you wish you can rent a boat to visit West Baray, the largest man-made water body at Angkor. It has an island with ruins of West Mobon temple. Enjoy a leisure walk here or swimming. Visit Artisan D Angkor to get your hands on some wonderful pieces of Khmer Arts & Crafts, made by locals living in the rural areas. In the afternoon, get transfer to Siem Reap airport to board a flight to Bangkok. 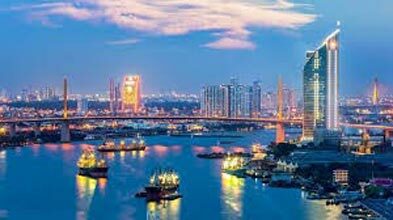 As you arrive at Bangkok Airport, our tour representative helps you with an assisted transfer to Pattaya, around 150 km south-east of Bangkok. This road transfer takes around 2 hours. On arrival, complete the check-in formalities at the hotel. Pattaya is an amazing beach retreat that offers best of recreation, adventure, sightseeing and entertainment. The evening can be spent at leisure or you can also opt for the fun and exciting Alcazar Show, same as the Lido and Moulin Rouge. An amalgam of acting, sensuality, costumers, music, lighting and glamor, the show is performed in a huge theater with 1200 seats and state-of-the-art sound system. Have dinner at an Indian restaurant. Start the day with a healthy breakfast, after which you proceed for Coral Island Tour. You will be transferred from your hotel to the point where speed boat to Coral Island known as Koh Lann Island is waiting. Koh Lann caters to all kind of tourists. Laze around the soft sands on the heavenly island. Try out the thrilling water sports, like parasailing, water-skiing and jet-skis. For underwater exploration, snorkeling and deep-sea diving are the best sports. The neighboring islands of Koh Krok and Koh Sak have an abundance of coral and undersea life. Gear up and be amazed by the multi-color water world. However. Tourists are requested to bring their own diving equipment since there are no dive shops in this area. **Please note this tour is not included parasailing and undersea walk if you want you can purchase as an optional. Later, take the speed boat that will bring you back from the island followed by lunch at Indian Restaurant in Pattaya. Overnight stay in Pattaya. Post breakfast, return to Bangkok, known for its spas, temples, shopping experiences and exciting nightlife. On arrival, complete the check-in. 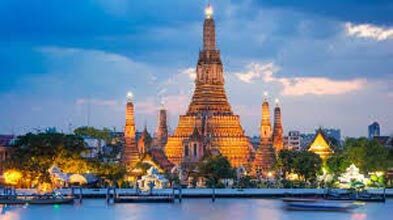 Embark on temple tour of Bangkok. Temples here are known as Wats. The first visit of the day is to Wat Traimit, the temple of the Golden Buddha. Spot a huge 5.5-ton statue of Lord Buddha, which is made from solid gold. This statue is an example of Sukhothai art. Next in line is Wat Pho, the temple of the Reclining Buddha. This temple is the largest temple in Bangkok. Later on, indulge in shopping at the Gems Gallery. Dinner at a local Indian restaurant. After breakfast, the day is at leisure. You can explore the place on tour own and enjoy the facilities at the hotel. You also have an option to visit Safari World and Marine Park, an open zoo, which is one of the most popular attractions in Thailand. The Safari World Park is segregated into four sections - Safari Park, Bird Park, Games Corner and Macaw Island. See exotic animals like seal, dolphins and orangutans and a variety of colorful birds a pleasing African setting. There are a number of eating spaces where you can have lunch. Back to the hotel for relaxing. Spend the evening as per your liking. Dinner at the local Indian Restaurant. After breakfast in the morning, complete the check -out formalities. Later, get on-time transfer to the Bangkok International Airport to board the flight for your onward journey.